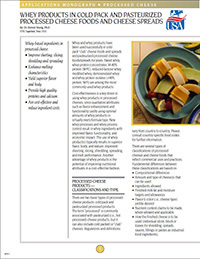 An 8-page monograph discussing the classifications and types of processed cheese products; the rationale for using whey in processed cheeses and related products; typical formulas using whey ingredients; the impact of whey ingredients on the manufacture of processed cheese; and how to select whey ingredients. Also includes a Q&A section. Also available for free download in Chinese (Simplified) │Korean.